Matt Keikoan Wins the Bracelet! After 161 hands of play, 68 of them heads-up, we have crowned a champion here in Event #7. Matt Keikoan bested a field of 1,592 players over the course of three very long days to win his first bracelet at his first WSOP final table. He took his time during the early stages today, playing patiently and making prudent decisions. When we got to three-handed, and especially heads-up, he put on a clinic in power poker. As his opponent got shorter and shorter, Keiokan pushed harder and harder, and eventually bested runner-up Shannon Shorr. 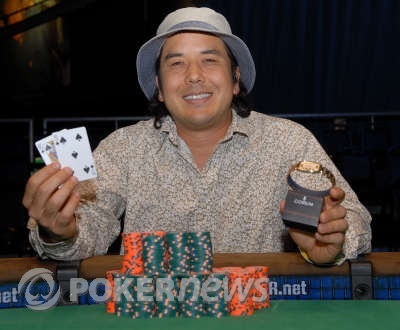 Matt Keikoan, will walk away with $550,601 in cash, and something money can't buy: a gold WSOP bracelet. 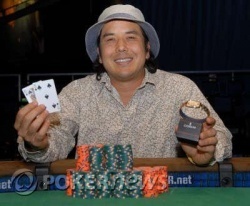 Congratulations to our 2008 WSOP Event #7 Champion! The crowd is on their feet as the flop comes . Shannon Shorr will need serious help if he is to come from behind and avoid elimination. Without the normal "delay for delay's sake," the dealer puts the on the turn. It's all over. Matt Keimoan has won his first bracelet. The on the river was a mere formality. Shorr congratulated the champion and then received heartfelt consolation from his legion of supporters. 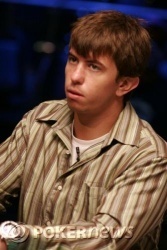 Shannon Shorr falls painfully short of his for WSOP bracelet but will leave with $349,141 to show for his outstanding efforts. Matt Keikoan has the button in seat 1. All in by Keikoan. Fold by Shorr. Shannon Shorr has the button in seat 3 and he moves all in. Matt Keikoan folds and Shannon Shorr wins the blinds and antes. Matt Keikoan has the button in seat 1. Keikoan keeps with tradition and moves all in. Shorr rubs his cards on the felt, and one at a time lifts each one up to his face to check it. No good, he mucks them again. Matt Keikoan has the button in seat 1. Keikoan is all in, Shorr folds.